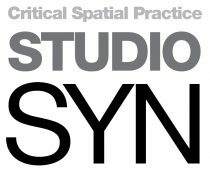 Studio SYN is a London-based critical practice operating in the fields of spatial design, art, research and education. The founding members Dejan Mrdja and Ursula Dimitriou met years ago during an experimental workshop in the industrial district of Antwerp, Belgium and have since stayed true to the initial position of their practice – modern and critically distant from centres of popular opinions. Studio SYN remains consistent in taking on the projects that represent challenges to the knowledge already gained.